As the map above shows, Austria-Hungary in 1910 was one of the most ethically diverse countries in history. It was also the second largest country in Europe (behind the Russian Empire) and the third most populous (behind the Russian and German Empires). 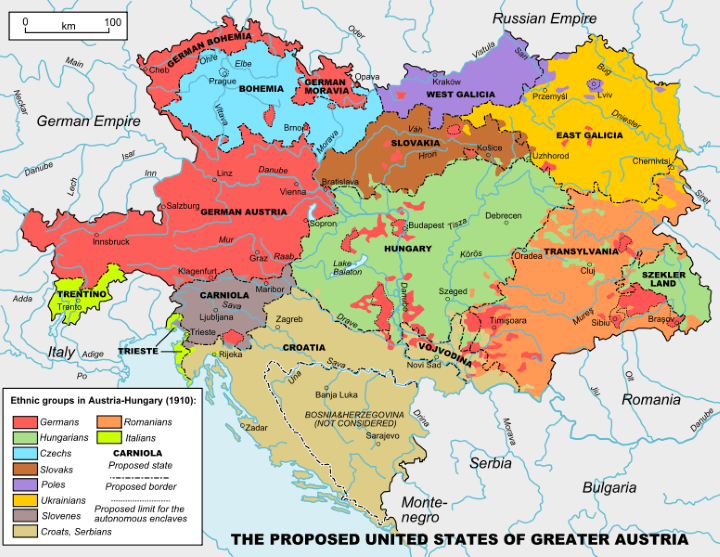 Austria-Hungary was only formed in 1867, as a result of the Austro-Hungarian Compromise of 1867. The compromise was direct result of The Austrian Empire’s complete defeat during the Austro-Prussian War, which left it on the verge of total collapse. The compromise of 1867 both saved the Habsburg Monarchy and transformed Austria into a dual monarchy where both the Austrian and Hungarian crowns were equal. The compromise, on the whole, worked reasonably well for the Austrians and Hungarians living in the Empire, but didn’t give much representation to the Empire’s other minorities. Given that the German speaking Austrians and Hungarians together only made up 42.93% of the Empire’s population, the compromise was not exactly a recipe for long term stability. Ultimately, the Empire was unable to survive the strains of World War One and finally collapsed in 1918. So the map above shows an Austria and Europe that might have been had there been more of willingness and ability to compromise between different groups. Following the total devastation of the Second World War, Europeans did in fact start coming together. Forming the European Economic Community in 1957, Schengen Agreement in 1985, European Union in 1993 and Euro in 2002.